Make no mistake, I am a texture junkie. I love getting lost in the endless ways of creating all manner of washes, splotches, scribbles, patterns, etc for use in my digital collages. 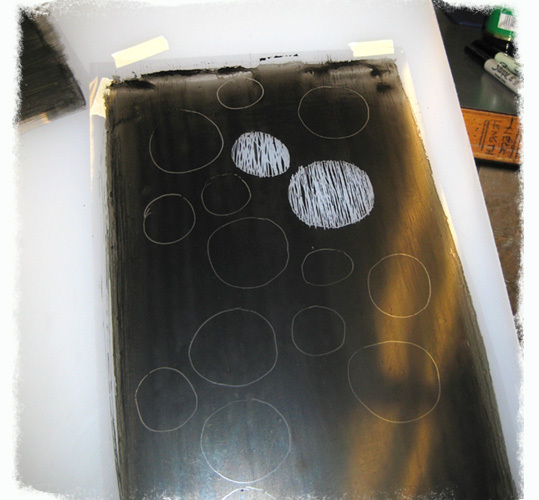 My favorite method is using ink on clear acetate. 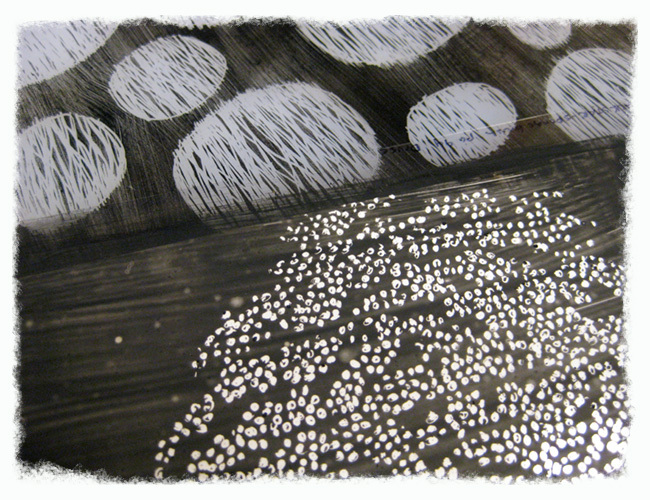 Working in various stages from wet to dry, there are so many ways to apply and manipulate the ink. Even different brands have such varying qualities that I use a database to keep track. 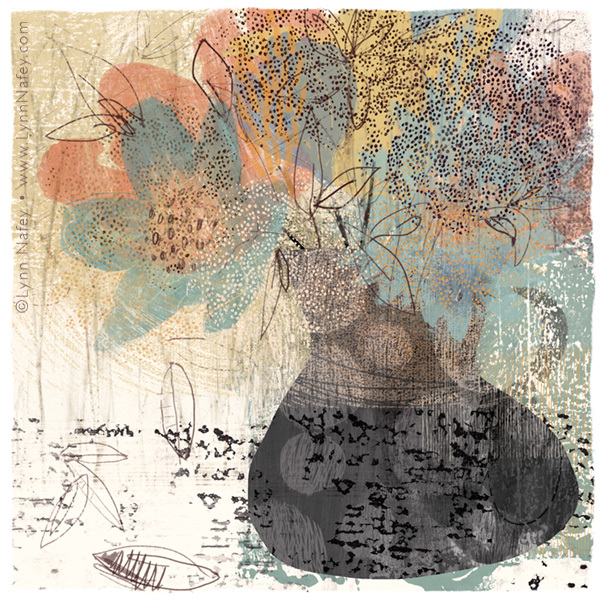 Here I show two ink wash drawings in progress and their final incorporation into a digital collage. For both of these, I first brushed on the ink and let it dry. Then I etched into the ink with a sharpened wooden point, doodling in a meditative way and not giving much thought to the end purpose. On the circle pattern, I dry brushed it for an overall distressed effect. There is something about the give and take of the ink on acetate that resonates with who I am as an artist and allows an interplay, or “dance” as I like to call it, between the part of me that prefers things neat and controlled and the side that likes the expressiveness of loose and serendipitous marks. 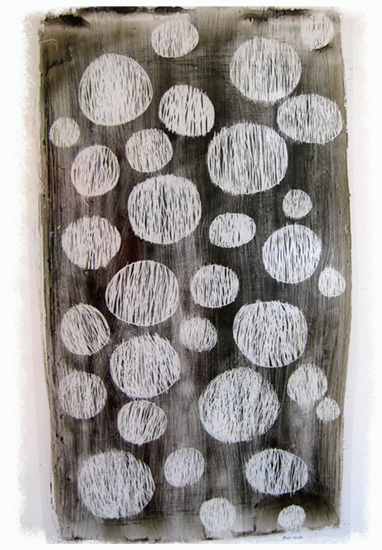 The above acetate drawings, along with many other textures, were incorporated into the image “On A Breeze #2”. The circles can be seen in the vase pattern and the lace cap flower within the bouquet (digitally reversed in this case). I use a variety of digital techniques to color and blend the textural layers until I get the desired effect. 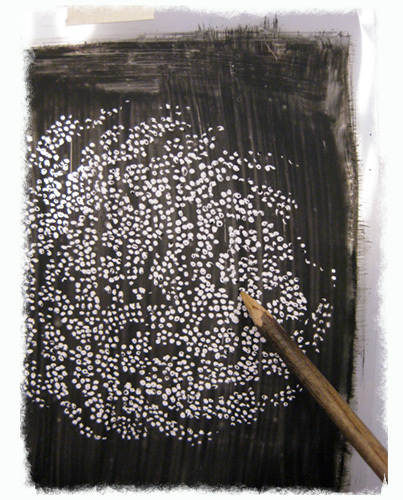 I love how texture breathes life into an image by engaging our senses and infusing it with energy and movement. If you are a kindred spirit and passionate about texture, feel free to share your comments, inspiration, and/or process below.